Boy is that title ever a mouthful! It is a delicious mouthful though, I promise! 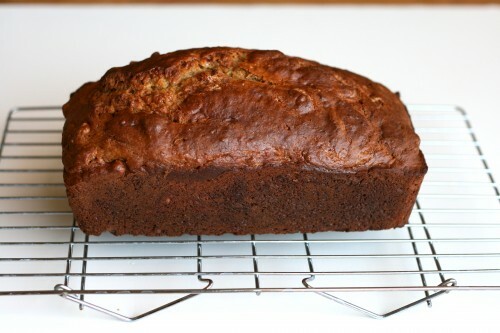 I don’t know about you but banana bread has to be hands down my favorite quick bread. There is just something so homey and nostalgic about it even though I don’t think I ate an overabundance of banana bread growing up. When grocery shopping I usually always grab extra bananas in hopes of turning them into banana bread or muffins. Nine times out of ten though my children will devour each and every banana before they get a chance to become extra ripe. Late last week I noticed that the kiddos weren’t eating the bananas as quickly as normal. They were starting to turn a darker yellow and getting those delicious brown speckles on them. So I grabbed them and stuck them up on the counter out of eyesight. Out of sight out of mind, right? Well it worked. I had enough ripe bananas to whip up some banana bread this morning. 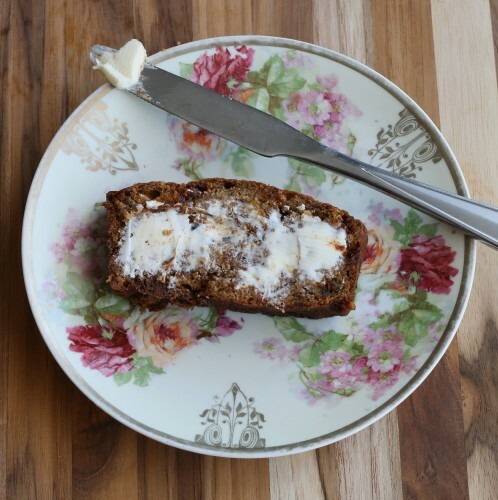 I have a go-to banana bread recipe that I have been making since I was little. It is basic. Very traditional. I can polish off a whole loaf by myself in a day. Sometimes though you want to try something else. 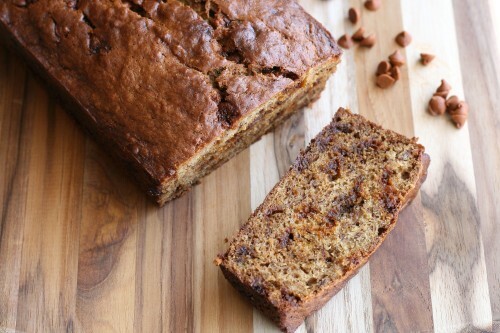 Banana bread is the perfect vehicle for trying something else. 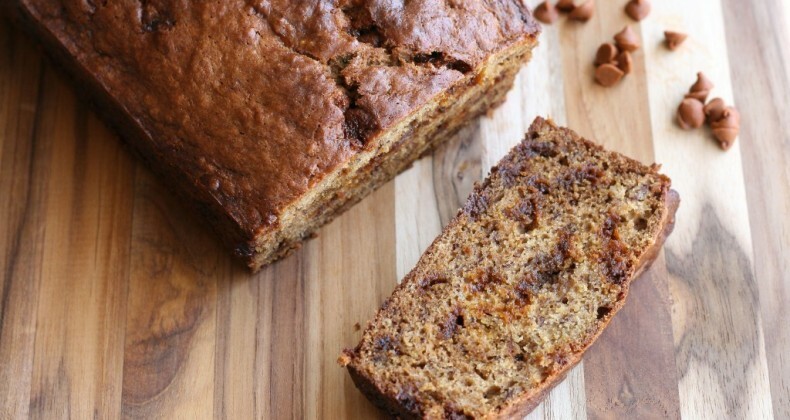 You can’t just have one banana bread recipe, can you? I think not! This one you will certainly want to try. Browned butter (nectar of the gods) lend a caramely and nutty flavor, and the cinnamon chips work so well with it. It is so easy to mix up. 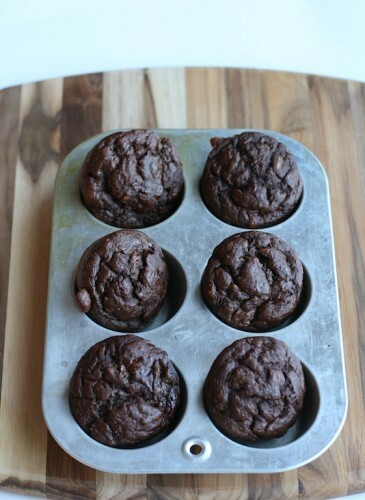 You can do it in one mixing bowl using a fork. Kasper, my two year old son, was eager to help so I set him to work. Look at that concentration. Let me tell you his bananas were mashed to perfection. I love it when my kiddos want to help in the kitchen! You should be able to find cinnamon chips in the baking aisle right next to the chocolate chips. 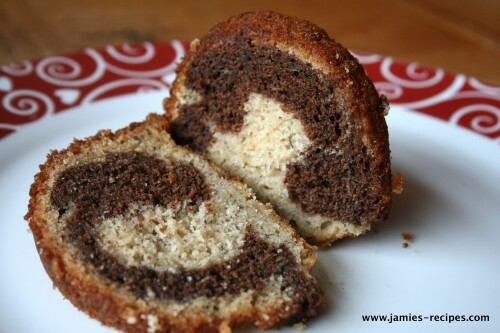 Or if your grocery store has a special baking section for holiday baking you will most likely find them there. This is currently Kasper’s favorite song. It is a catchy little tune and you will be singing it all weekend. Melt butter in small saucepan over medium high heat. Reduce to medium low and cook until the foam mostly disappears and starts turning golden brown. This will take about 5 minutes. Keep a careful watch on it so it doesn't burn. Remove from heat and allow to cool. 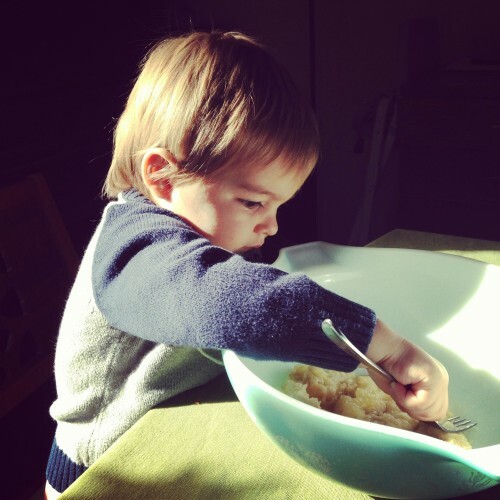 In a mixing bowl mash together bananas. Stir in slightly cooled browned butter and brown sugar. Mix in egg and vanilla. Mix well to combine. Add in flour, soda, salt, and nutmeg. Stir until just combined. Gently fold in cinnamon chips. Pour batter into prepared pan. Bake for 60 minutes or until tester comes out clean. Have some patience and allow to cool about 10 minutes before removing from baking pan and serving with a giant smear of butter. 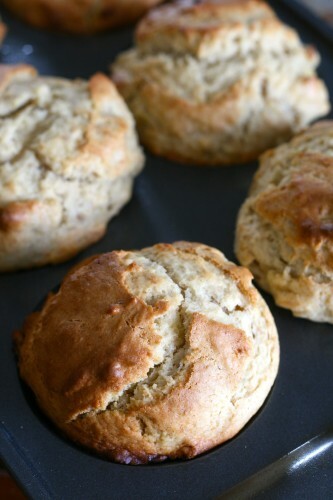 I don’t make bread as nearly as I should because based on this recipe I should be eating it every single day! Hope you had a great weekend! I guess I could call it BBCCBB but that just seems too complicated 🙂 I hope you enjoy the bread!